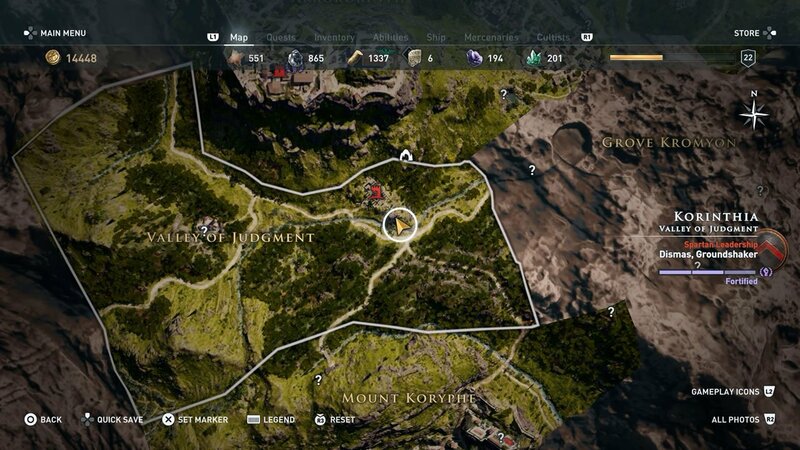 The Stone Cold Ainigmata Ostraka points players to a reward hidden in the outskirts of the Valley of Judgment. 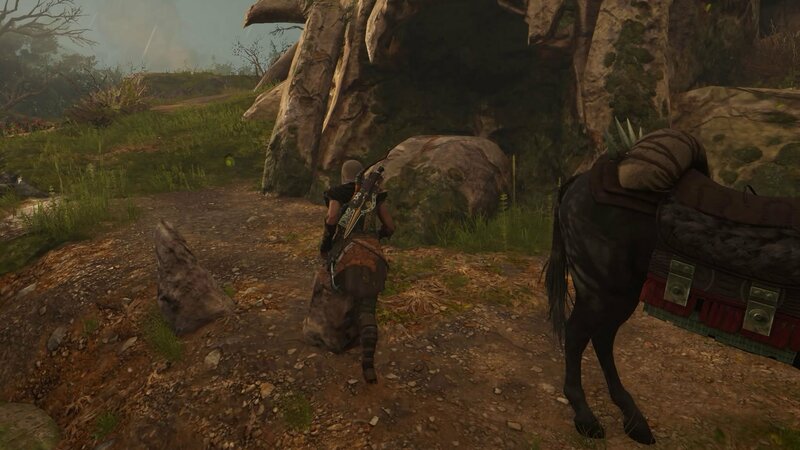 Assassin's Creed Odyssey players looking to boost their hero's offensive capabilities will surely be on the lookout for Ainigmata Ostraka, the series of riddle tablets scattered all about Ancient Greece. The Stone Cold Ainigmata Ostraka can be found within the Secret Cave, and points to a treasure located in the wilds of the Valley of Judgment. As with all of the other Ainigmata Ostraka treasure hunts in the game, once the tablet has been found, open the inventory and inspect in to reveal the clue phrase. "Travel southwest of Korinth in the Valley of Judgment to find a beautiful monster. You can find me on the tip of her tongue. Just be careful not to be swallowed by her gaze." Unlike some of the other clue phrases that almost directly spell out the location of the reward, the Stone Cold clue phrase dips itself into familiar Greek myths. The "beautiful monster" whose gaze players are advised to avoid is none other than Medusa, the fearsome Gorgon of Greek legend. With that in mind, players need to seek out the Cyclopean Head of Medusa, found near the northeast border of the Valley of Judgment in Korinthia. Once in the area, circle around the massive tree to spot Medusa's less-than-beautiful face, then approach the tongue of the monster and use the interact button to claim the reward: an engraving that deals an additional 20% Critical damage while the player is at full health. With the Stone Cold Ainigmata Ostraka reward sealed away, it's time to move on to the rest of the game's hidden engravings. 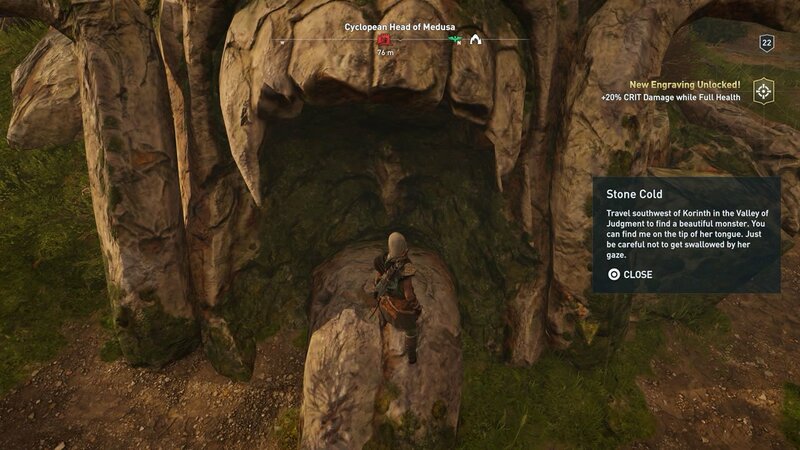 To learn more about the others, or to get up to speed on Cultist locations or game mechanics, be sure to stop by Shacknews' Assassin's Creed Odyssey walkthrough and guide.